Whenever author Sir Terry Prachett needs a good idea, he counts on the "Goddess of Writers." 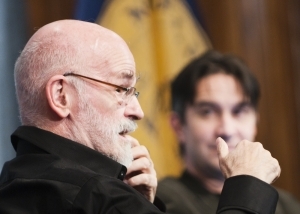 The imagined deity always helps with some timely coincidence, Pratchett said at an Oct. 14 National Press Club Book Rap. One example was when he needed a name for the “5th horseman.” He was at a parade and float by Soak Milk passed by. Reflected in a window, he saw Soak backwards, Kaos, and that became the character's name. Prachett entered the Club ballroom to a standing ovation and kept the capacity audience, estimated at nearly 500, enthralled for more than an hour in wide-ranging talk. Prachett was assisted by Rob Wilkins. Other topics he discussed included: visiting weird places, such as Matter Matter, New Zealand;  Doctor Who;  his school years and the importance of libraries in his development as a writer. Pratchett mentioned that he  “occupied Wall Street”  but was surprised to see people who looked poor instead of men in pin-striped suits. Emily Whitten, a member of the Club's Book and Author Committee, introduced Pratchett. About 300 books were sold at the event.